After snagging a rebound, Kolbe Cathedral’s Shaniya Stancil (45) prepares go to the basket against Newtown on Friday night in Bridgeport. BRIDGEPORT — It was gut check time for the Kolbe Cathedral girls basketball team with three minutes remaining in Friday’s SWC showdown against Newtown. It was 48 hours after Kolbe saw a 16-point lead with 11 minutes left to play turn into a seven-point loss to Notre Dame. Friday the Cougars had a 21-point halftime lead at but led by just five when Robin Selitte went to the line for two free throws. One could say it was Selitte and the season that were on the line. Somebody needed to step — or as it turned out, jump — up. Kolbe’s Mishell Pringle did exactly that. Selitte made the first shot to push the lead to six but her second shot missed and was ready to drop right into Newtown’s Jackie Matthews’ hands. A collective “Uh-oh” could be heard in Shehan Center because Newtown had been red-hot (10 made 3-pointers in the second half). But up jumped Mishell Pringle out of nowhere for the rebound and her putback made it an eight-point lead. A few minutes later Kolbe had escaped with a 54-47 victory. Kolbe (17-2, 10-2 SWC) settled down from there and held on for the victory in a battle of top 10 teams. “You’re always nervous in a situation like that but I was focused and thinking that I have to use all my strength to get that rebound,” Pringle said. Pringle finished with 10 points and 11 rebounds, and was also the “1” when Parker went to a box-and-1 defense to slow down Newtown’s hot-shooting Nicole DaPra (19 points), who made five 3-pointers in the second half. Kolbe took a 31-10 lead at halftime as Newtown missed 16 of 21 field goal attempts and was outrebounded 20-14 (39-24 overall). “We could do no wrong in the first half,” Parker said. But Newtown looked more like the the No. 8 team in the state (Kolbe was ninth) in the second half when DaPra and Cyleigh Wilson (three treys) got hot. “We gave (DaPra) the green light to shoot it,” O’Connell said. A 31-15 run by the Nighthawks made it a game, until Pringle stepped — uh, jumped — up to quite possibly save Kolbe’s season. Gracen Kerr had 14 points and five assists for Kolbe while Brianna Meekins had 11 points, Shaniya Stancil had 10 points and eight rebounds and Selitte added eight rebounds. 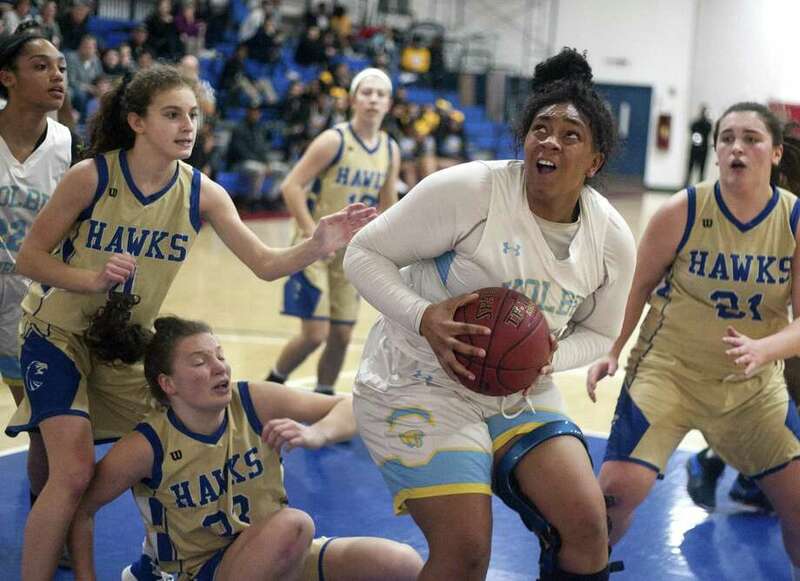 Newtown’s Nicole DaPra had 17 of her 19 points in the second half but Kolbe’s Mishell Pringle had 10 points and 11 rebounds and her fourth-quarter rebound and put-back on a missed free throw ended Newtown’s comeback hopes. “We laid an egg in the first half. We let them be the aggressor the whole half,” — Newtown coach Jeremy O’Connell.